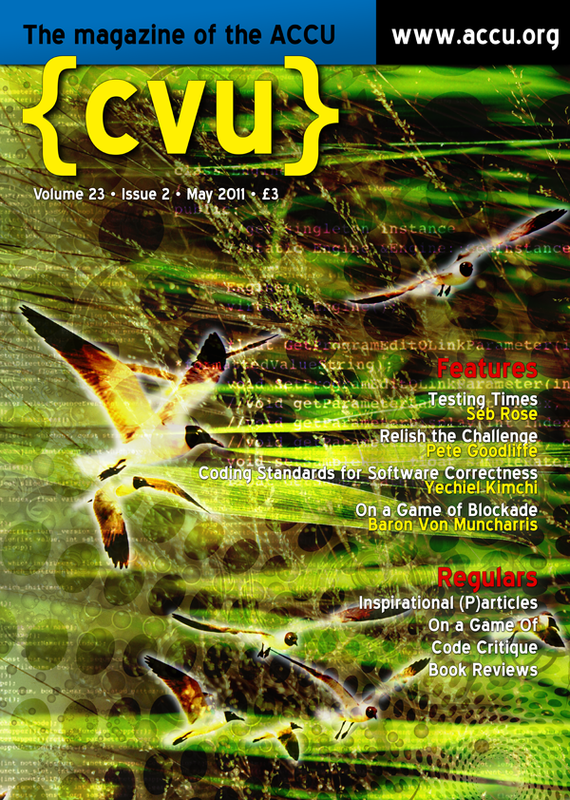 The May issue of ACCU's C Vu magazine will be hitting doormats any moment now. It contains the latest instalment in my Becoming a Better Programmer column. This one's called Relish the Challenge, and is an encouragement to stay motivated and challenged, to seek out new things, and to avoid becoming stale and staid as a developer. I hope it's useful. For your stimulation, I've added the final questions from the article to the end of this blog post. The PDF version of the magazine will be available for download by ACCU members shortly. The cover I created for this month's issue is quite dense and busy. I wonder if that's any reflection on the designer? Do you have projects that challenge you and stretch your skills? Are there some ideas you’ve thought about for a while, but not started? Why not start a little side-project? Do you balance ‘interesting’ challenges with your ‘day to day’ work? Are you challenged by other motivated programmers around you? Do you have a broad field of interest that informs your work?